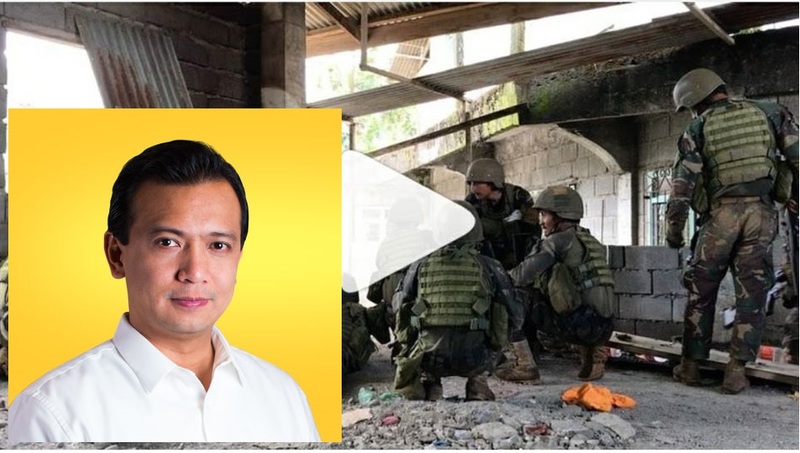 Thinking Pinoy: Did Verafiles "Fact Check", or did it just follow Trillanes' orders? My post caught the attention of netizens, which resulted into a hailstorm of criticism against Aznar. Aznar also posted on Facebook that, among other things, threatened me with possible legal action. I have chronicled much of the exchange between Aznar and I in the article “NUJP’s Condemnation: Jes Aznar, Marawi Siege, and Matobato”, published on 20 June 2017. Aznar, the guy who claims to be brave enough to cover a war but cowers in fear of social media comments (what a whiny MF! ), asked for backup from his mainstream media buddies. Aznar claimed that the video was a late upload, despite the video being taken and uploaded on the same day. I used the term “Live update” and not “Live Feed”, which a layman would define as information posted on or immediately after a subject-event. NUJP failed to disclose in their condemnation its president, along with four out of its nine board of directors harbor conflicts of interest. They work for the Philippine Daily Inquirer which has a business relationship with the New York Times, Aznar’s premier client. Second, he sought help from the National Press Club whose former president Joel Egco now heads the Presidential Task Force on Media Security, and I have also thoroughly addressed that in “A Traitor in Malacañang? Media Security Usec. Joel Egco usurps Andanar’s authority”. That Aznar’s video post was a live feed. That the soldiers involved are government snipers. That there were orders to arrest Aznar. This is downright pathetic misrepresentation of the original post, which is disappointing, considering that the piece was written by Charmaine Deogracias, supposedly a veteran journalist. Before one does a fact check, one has to make sure that the facts he will check are the ones that are supposed to be checked in the first place. First, my original Facebook post used the term “Live Update” and not “Live Feed”. I have already explained this in a previous article and I do not understand why Deogracias, for all her pride in being a veteran journalist, missed it entirely. Moreover, we can argue all day about what “live” means, but for the regular person, “live update” means an update given during or immediately after an event. More on this later. Second, Verafiles simply nitpicked the definition of government snipers. Deogracias again went on to define what government snipers mean, essentially saying that the people involved are not snipers because they do not use sniper rifles. Deogracias was again caught up with technicality, as the regular dictionary meaning of a sniper is “someone who shoots at people from a hidden position” [Collins]. Yes, Deogracias may still insist on her jargon on the previous two points, but that’s a pile of B.S. for regular readers because it goes against the principle of readability for journalistic work. Third, Verafiles essentially claimed thate I said that there were orders to arrest Aznar, even if I didn't. I do not know if the supposed veteran journalist has serious comprehension issues, but it’s clear that I said that the AFP legally has the option to arrest Aznar, and I made sure to say nothing about whether AFP will arrest him or not, as that would be usurpation of the authority of the AFP spokesperson, which can land me in jail for up to 10 years. Miss Deogracias, I am not as stupid as Undersecretary Joel Egco, who repeatedly usurped Presidential Communications Secretary Martin Andanar’s authority to issue press releases. At this point, I have shown that the list “facts” that Deogracias “checked” are faulty at best, but let’s pretend that everything’s ok so far, and let’s further examine her post. Deogracias tried to debunk my misrepresented claim of Aznar’s video post being a “live feed” by referring to file metadata, or those hidden pieces of information that are embedded in many computer files. Specifically, she cited that the video clip’s metadata indicates that it was created on 1:19 PM, i.e. the time when the file was transferred to the PC. Along with Aznar’s supposed claim that the actual footage was taken 19 minutes earlier, she immediately concluded that the clip in question was not uploaded until 73 minutes later or at 2:13 PM, or the timestamp on Aznar’s Instagram upload. This methodology has several flaws. First, synchronization of clocks.Let me note that Deogracias did not verify the Aznar’s clock is synchronized with Instagram’s clock. That is, she did not verify if 1:19 PM on Aznar’s Macbook is also 1:19 PM on Instagram. That is, Deogracias simply assumed that they were synchronized. Fine! Like Deogracias, let’s assume that the time setting on Aznar’s devices are not significantly out-of-sync with Instagram’s. Second, authenticity of metadata.Deogracias took Aznar’s word as if it’s set on stone, even if it’s an established fact that Quicktime Movie metadata can be modified in various ways, one of which is through the QuickTime movie metadata editor. How sure is Deogracias that Aznar didn’t tamper with evidence, especially since Aznar previously and surreptitiously attempted to tamper with evidence before. Fine! Like Deogracias, let’s pretend that all metadata in Aznar’s files are authentic. The time setting on Aznar’s devices are not significantly out-of-sync with Instagram’s. All metadata in each of Aznar’s files are authentic. Now, let’s take a look at photos that Aznar took during the same event, photos that were uploaded to Getty Images, the stock photo agency that serves as one of Aznar’s monetization platforms. Specifically, I went to GettyImages and searched for Aznar’s photos dated from 24 May 2017 to 26 May 2017. The search yielded a gallery of images that you can see by clicking here.I took a hard look at the background of Aznar’s Instagram video, then I looked for Aznar’s photos in the Getty Image Gallery with the same background. I found seven images that appears to be taken in the same place as the video. Clicking on a photo creates a popup window where larger version of the photo appears. 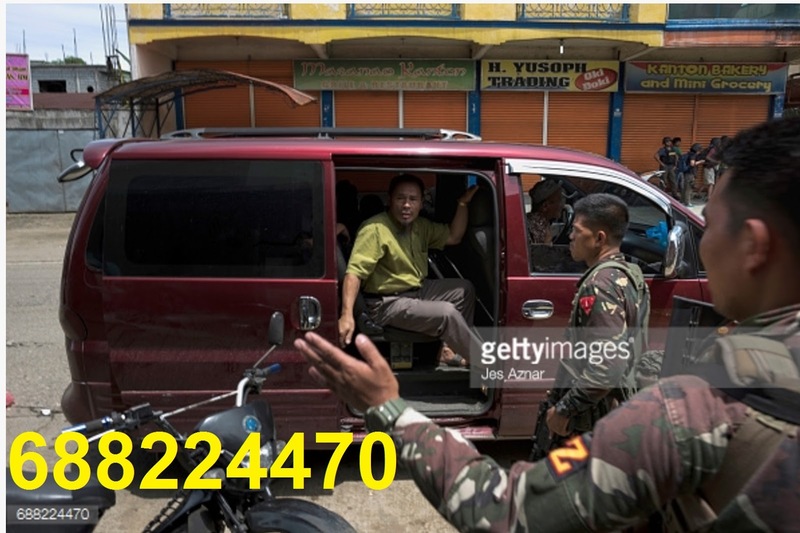 The larger photo is watermarked with “Jes Aznar”, “Getty Images”, and its property/image ID. The image below shows a thumbnail of these seven photos along with a snapshot of Aznar’s Instagram video. I labelled each photo with its corresponding property/image ID. Deogracias’ article derives much of its supposed legitimacy through its citation of metadata, so I felt it proper to give Deogracias (and Aznar) a taste of their own medicine. Let’s get some bit of the metadata from the seven Aznar photos I mentioned in the previous section. To do this, we use the Getty Images API tool. STEP 1: Go to https://api.gettyimages.com/swagger/ui/index#!/images/images_Get and register. After email confirmation, you’ll be given an API key. 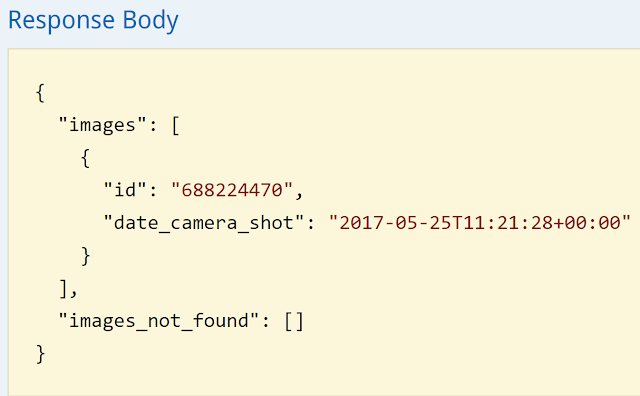 STEP 2: Go back to to https://api.gettyimages.com/swagger/ui/index#!/images/images_Get, scroll down to “Images”, then click “Show/Hide”. STEP 3: Click the bar that says “Get metadata for a single image by supplying one image id”. STEP 4: Insert or type in the relevant image ID. 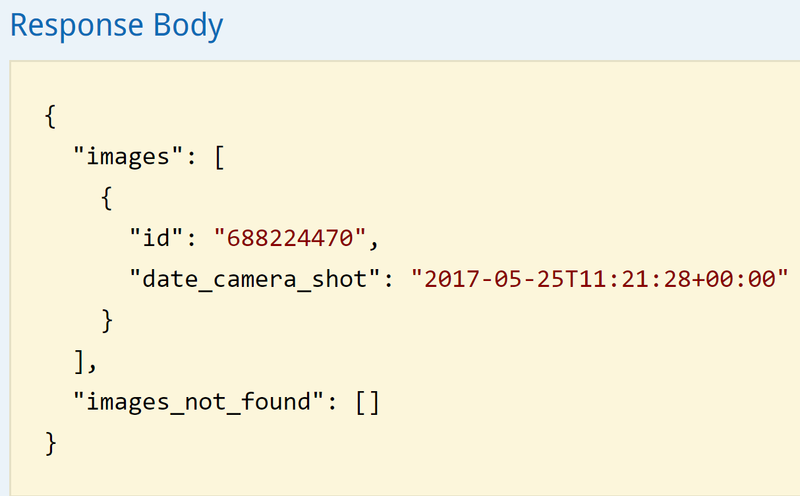 STEP 5: In the fields, tick the box for “date_camera_shot”. I’ll tell you why later. To make it easier for the reader, I created a simple table that shows the image IDs with corresponding metadata. The field “date_camera_shot” is the time that the camera took the photo based on the camera’s internal clock at the moment the photo was taken. The time notation includes “+00:00” or UTC+00. However, cameras do not really care about time zones, so if you’re in the Philippines and you took a picture with the camera clock at 12 noon, the metadata will show 12:00:00+00:00, even if your actual time zone is +08:00, or UTC+08. For example, the photo with Image ID 688224470 shows a van whose shadow is directly beneath it, suggesting that was taken at around noon. Judging from the shadows, Aznar's 25 May 2017 photo with Image ID 688224470 must have been taken at around noon. 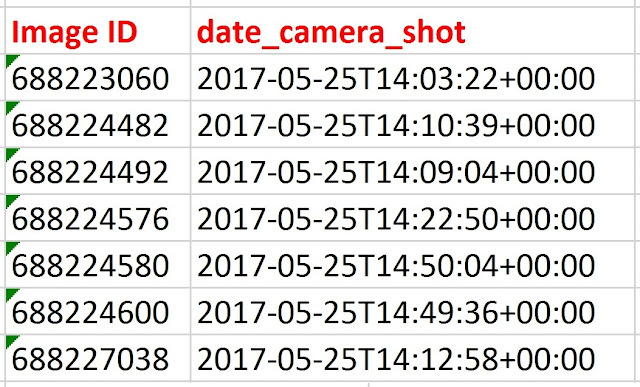 True enough, Image ID 688224470’s metadata shows that it was taken on “2017-05-25T11:21:28+00:00”, or at 11:21 AM of 25 May 2017. Moreover, 11:21 AM UTC+00 is equivalent to 7:21 PM Manila, and such a photo could not have been taken at nighttime. Let’s now simplify the table in the previous section by translating the time stamps to regular AM/PM format. That is, we now see the times at which each of the seven photos were taken, photos whose backgrounds match that of Aznar’s Instagram video. And yes, there something going on. Aznar claimed the video, uploaded at 2:13 PM, was taken at around 1:00 PM while the troops, along with Aznar, were on the way out of the area. The problem, however, is that the time stamps of his Getty Images photos suggest otherwise, because they were all taken AFTER 2:00 PM. 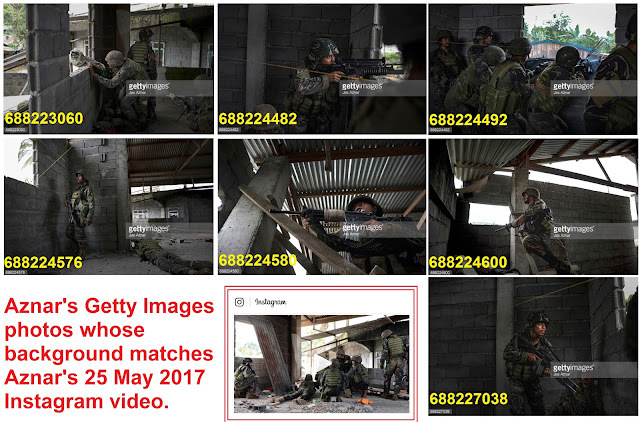 Let me repeat: Aznar said they got out of the structure at 1:00 PM, yet there are photos taken after 2:00 that show soldiers present in the same structure. Moreover, these photos were taken by Aznar himself, so he was still in the structure at 2:50 PM, based on the timestamps of the seven photos. Yes, some soldiers were still in the structure by 2:50 PM based on the timestamps, and Aznar uploaded the controversial video at 2:13 PM, suggesting that the soldiers’ whereabouts were exposed for 37 minutes before the earliest time that they could have gotten out of the structure. 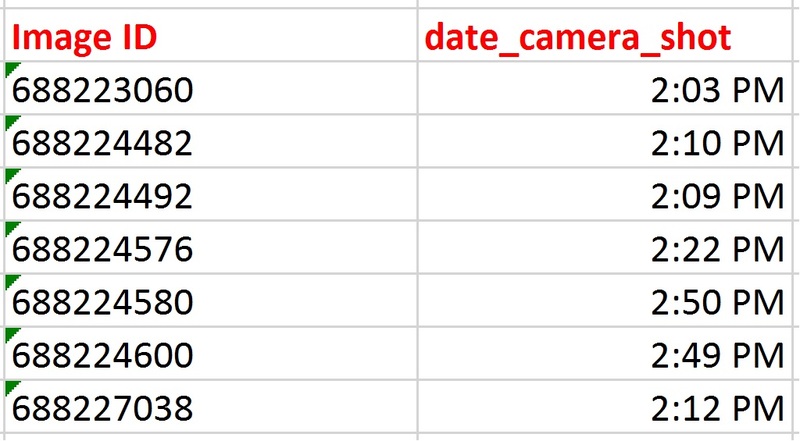 Note that I sued “date_camera_shot”, which refers to the time that Aznar took the photos, NOT the time when he uploaded the photos to his Mac. Hindi nakakatalino ang Mac, pramis. Sabi ni Aznar, wala na sila doon sa building na hollow blocks na walang palitada ang pader by around 1 PM. Pero bakit may photos na may sundalo sa loob ng building at ang timestamp ay lagpas 2 PM? Meron pa ngang timestamp e 2:50 PM, o 37 minutes matapos i-upload ni Aznar ang video. Aznar’s devices are lying, i.e. are set incorrectly. If Aznar is lying, then the debate is over. On the other hand, if Aznar’s devices are lying, then Verafiles’s “fact check”, which relies heavily on time stamps and gross misrepresentation, falls apart. Will Verafiles insist that the timestamps on Aznar’s devices are reliable? If so, then that means Aznar lied to his teeth. Will Verafiles insist that the timestamps on Aznar’s devices are unreliable? If so, then that means Verafiles are filled with amateurs, not veterans. This is what happens with shoddy investigations, and I am confident that "veteran journalist" Deogracias can do better than this. I was kidding on that last one. What's most perplexing in this Verafiles article is the shoddy journalism from the supposedly veteran journalist Charmaine Deogracias. A little research, however, provides clues on why Verafiles allowed the publication of garbage likes this. Verafiles President Ellen Tordesillas has very close ties with Senator Antonio Trillanes' Magdalo Party. Aside from having a close personal and professional relationship with Magdalo hacker Bem Pontejos, Tordesillas was instrumental in the BPI Julia Vargas Scandal, the same scandal where Trillanes accused then-presidential candidate Rodrigo Duterte of amassing P211 million in ill-gotten wealth, with the only evidence being a pathetic excel printout. On the other hand, Jes Aznar was the same person who sold the Matobato video to New York Times, so that means Aznar had access to Matobato PRIOR to the Senate Hearing. Now, guess who Matobato's handler was? Sonny Trillanes. Second, they are not very techie. Well, Verafiles president isn't very techie to begin with, as I have demonstrated in "Sonny Trillanes and his Hacker-friend". In that article, I showed that Verafiles president Tordesillas knows little about technology (she didn't even have domain privacy for her blog! ), so I guess Deogracia's editors are unlikely to notice that Charmaine has been spewing garbage lately. 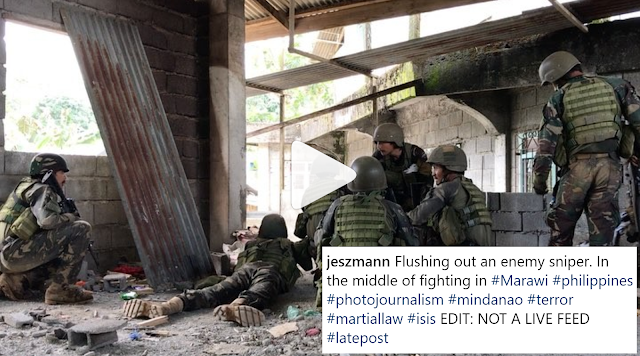 The original post I made about the Aznar video was about one simple thing: journalists should know when to get out the way to prevent exposing our soldiers to additional, unnecessary risks. But judging from court records, that's something that Verafiles "fact checker" Charmaine Deogracias disagrees with. Let's take a look at Deogracias et. Al. vs Sec. Puno et. Al [PCIJ]. In one 2007 morning, Sen. Trillanes and and the Magdalo Group walked out of the Makati City Regional Trial Court, marched toward the nearby Manila Peninsula hotel,took over it and called for the President Arroyo's ouster. Later in the afternoon, the PNP attempted to serve an arrest warrant against Trillanes. The PNP also demanded that journalists covering the event should leave the hotel right away. Many cleared the premises but Tordesillas and Deogracias, among others, defied the PNP's order. Smells like obstruction of justice, aside from major ka-epalan, to me. Nevertheless, it appears that Tordesillas, Deogracias and Aznar, are cut from the same cloth. I would've love to write more about this, I guess I'll stop here. Magsama-sama na lang silang apat ni Trillanes. Hindi ko na ipu-proofread. Hindi sulit.